Home Theater 101: I bought a TV, now what? At Aperion Audio when I talk with people about putting together a home theater, most can be categorized into two groups. The first full of people that love audio and have built a nice system for music but now they want to watch movies at home as well. I’d say that about 10% of our customers approach building a home theater from that direction. The other, much larger percentage of customers start with purchasing a big flat panel TV and then realize that is sounds terrible. For those who are just starting from a TV purchase, let’s begin at Home Theater 101 and figure out just what components you need to put together an awesome home theater that fits your wants and needs. What are the most important components in your home theater? Your room and your speakers. What this means is that how your speakers and your room partner up directly effects the quality of your home theater experience. Most rooms are fairly accommodating, but there are a few tips to be aware of. It’s best if your room is no smaller than 200 square feet. For smaller rooms place your viewing area (where your TV goes) along a short wall. For larger rooms either a short or a long wall work equally well. In Case You Didn’t Know: Rooms shaped like perfect squares are not so good for home theater systems. Rectangles, triangles, octagons and spheres are all welcome. Too many bare surfaces in your room will reflect and distort the sound. Carpeting, drapery, upholstered furniture and that favorite lounge chair all work together to enhance acoustics. Oddly enough, a bookcase located behind the seating area works exceptionally well as a bass trap, to reduce room reflections and to help smooth out the high and mid range signals. A bass trap is something that reduces room resonances that can cause your bass to be too boomy. Finally, be aware of lights that reflect off the TV screen. Try turning on all the lights at once then plop down in your seating area. If any lights are reflecting off the TV you have three options: move the offending lights, reposition your TV, or watch with the lights off. 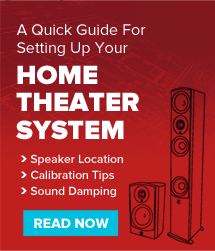 There’s plenty of products to choose from out there, but instead of focusing on the brands, let’s just fill in the required products for putting together a 5.1 home theater system. Speakers! More specifically 5 speakers and 1 subwoofer. Size and type will vary, but you’ll want a pair of Front speakers. This is your Left and Right speakers in the front and will be doing some of the major lifting in terms of overall sound for movies, and almost all of the sound for 2 channel music. Pick a speaker that fits your room and your needs whether that be a Tower for larger rooms, and bookshelf or in wall for medium or space constrained rooms. A powered subwoofer. Subwoofers are key for bringing that theater experience to your home. Subwoofers handle all of the low frequencies that your speakers can’t, and most of them are powered so you just need to connect them to the receiver, adjust the volume and crossover and it will handle the rest. A home theater receiver. You want to pick an AV Receiver that has all of the features you need as well as enough power to run your speakers. There are plenty to choose from, so do your homework but remember, most of the larger receiver companies have competing models and features. Pricing will start around $400 for a decent entry level model up to $2000 or so for one that can power a 7.1 system and a few other rooms of audio. We recommend Marantz, Denon, Yamaha, Onkyo, Pioneer Elite as far as the big names go, and of course there many other smaller companies that offer outstanding products as well. Speaker wire and cables. You need to connect each speaker to your receiver with 2 conductor speaker wire. Look for copper 12 gauge wire and you’ll be set. In addition speaker wire you’ll need a subwoofer cable and a AV connections from your devices like a cable box or blu ray player to your receiver (usually HDMI or Optical). From your receiver, you need an Monitor Out cable (HMDI) that connects to your TV. Connecting your system this way will ensure that you get the best sound performance from your system. Here’s a more in depth description from Crutchfield. Start with yourself. It is best to center your seating between the room’s sidewalls to optimize surround sound performance. If possible, position your seating just two to three feet away from your back wall. Now for the juicy stuff: speaker placement. Let’s start with your three front speakers. Your left, right, and center. How they’re positioned in relation to each other can dramatically affect sound. All three should be positioned at approximately ear level and at equal distance from the seating area. If you have a home theater speaker system, for every 10 feet of distance your seating area is from the TV, add seven feet of spacing between your left and right speakers. For example, if your viewing area is 20 feet from your TV, your left and right speakers should be spaced 14 feet apart. For music only systems, an approximate spacing of ten feet between your left and right speakers is ideal. Center channel speakers work best if they are on top or bottom of your TV. If your center speaker is the common style that has two woofers on either side of a tweeter, it’s important to aim the speaker directly at the seating area. Nearby walls can dramatically affect a speaker’s performance. You should follow the manufacturer’s recommendations as to speaker positioning. If this information isn’t available, a good rule-of-thumb is to keep the speakers at least three feet from the sidewalls, one foot from the back wall and flush or in front of the entertainment center furniture. Next are your surround sound speakers. Positioning is crucial in order to enjoy the ambient, non-localized sound that home theater is known for. Keep in mind there are two kinds of designs and several surround formats all with varying numbers of speakers. All side and rear surround speakers work best for home theater if they’re somewhere between ear level and two to three feet above your head. It’s also important to make sure the front speakers are as close to being the same distance from the main viewing area as possible. Dipole speakers work best when positioned alongside the listening area. Non-dipole (conventional) speakers can be made more diffuse sounding by aiming them away from the listening area. What about your subwoofer? Pretty much any location in the room will produce bass that will sound like it’s coming from your other speakers. However, this doesn’t mean all room locations are created equal. The quality of bass and how seamlessly the bass integrates with the other speakers are both affected by the subwoofer’s location. Try to keep the subwoofer(s) on the same plane as the front speakers. If this just isn’t possible, avoid placing the sub behind the listening area. Unless you like boomy bass, keep subwoofers at least two feet away from corners. Using two subwoofers creates a more level bass throughout the room. If you do this, resist the urge to be symmetrical with their placements. This will actually create an uneven bass sound. Powered subwoofers have some controls you’ll want to set properly. Take a seat in the viewing area and employ a helper to do the grunt work. Start with the “crossover frequency”. Set it to 80 Hz or less. Settings above 100 Hz and your ear will be able to locate the subwoofer (and you don’t want that). If there is a “phase reversing switch”, listen for the setting that creates the best bass for your seating area. Sometimes there is no noticeable difference. If the subwoofers are in the same plane as the front speakers, the “normal” or “0 degrees” position is usually right. Adjust the “volume” until the bass level sounds right—not too boomy yet not lacking in body. Once you’ve hit your ideal settings, live with them for a week or so. After that, if you’re still happy, you’ll probably never have to touch the settings again.